Is the Turkish Van right for you? The Turkish Van cat is a healthy and energetic breed that likes to play and may be trouble to keep up with. Turkish Van cats are great play friends and eat with gusto. The Turkish Van cat tends to bond with one or two people for life, which can make travel or life changes a hassle. 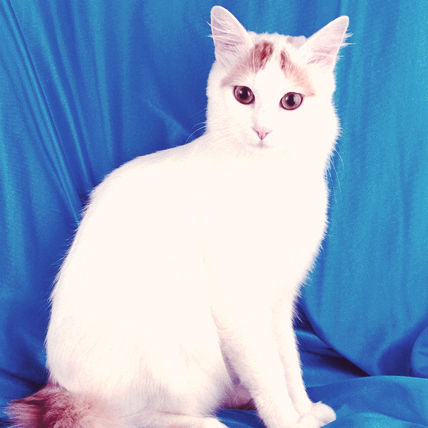 The Turkish Van hails from the mountainous areas in the Eastern Turkey, having lived since the middle ages. Their relative isolation from other breeds is thought to have lent something to the unique look they have cultivated. First discovered by the Western world in the 1950s, tourists in Turkey, Laura Lushington and Sonia Halliday, were struck by the unusual markings on these semi-longhaired cats, along with the fact that they enjoyed playing in the water. They were first brought to America in 1982. The Turkish Van is a large breed, with longish hair, making them look even bigger. Thanks to their unusual love of water, their coat is water-resistant, giving it a cashmere-like feel, stretching all the way down to their feather-duster tail. They have a powerful musculature, with broad shoulders, a deep chest, and long rear legs, making them appear like a true force to be reckoned with (from a mouse’s perspective). Their eyes are round and can be found in blue, green, amber, or odd-eyed. The Turkish Van is a fun-loving, caring, intelligent breed that is very active, sometimes veering off into mischief. They are great leapers, meaning that there are few places in your house that this cat can’t get to. Most notably, this breed is known for their very un-cat-like infatuation with water, going so far as to swim around of their own volition. They are great companions as well, getting along well with strangers, children, and other pets alike. While they may be family friendly felines, they are not ones to be held for long periods of time. The Turkish Van is always white with splashes of other colors, running the gamut of allowable fur colors. Typically, the patches are found on top of their head (often looking like eye brows) and on their tail. Turkish Van is a natural breed with comparatively less health issues. The average life expectancy of the breed is 10–12 years.